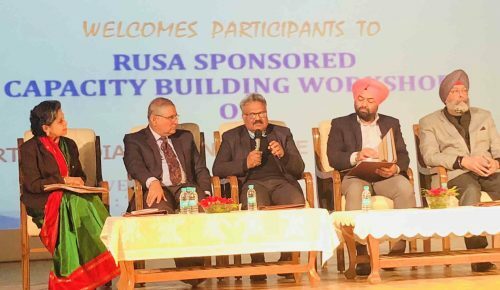 Chandigarh : The Post Graduate Department of Commerce of PGGCG-42 organized Capacity Building workshop “Startups India” under the aegis of RUSA. The Principal, Prof. Binu Dogra guided the event that primarily focused on furthering the government initiative shaping young minds to endeavor entrepreneurship. The chief guest, Dr. Dinesh Dua, CEO of Nectar life sciences, in his key note address emphasized the need to foster entrepreneurial skills. He motivated the students to take start ups in order to enhance the GDP of the country. He mentioned that in coming times Chandigarh would emerge as a new start up hub. The students and faculty interacted with the experts from industry and academia. Mr. Sofi Zahoor, Chairman, CII, Chandigarh Council & Sr. Director India- Quark shared success stories of startups and motivated students to actualize their dreams.Dr.Pushvinder Jit Singh, a first-generation entrepreneur and MD of Tynor Orthotics, inspired all by sharing his success story. Prof. Suresh Chadha from UBS, PU, Chandigarh led the vibrant panel discussion on bridging gap between industry and academia. The panel experts- Mr Harshvir Singh, MD of Drish Infotech ; Mr.Satinder Singh Ahuja National Head – Rural Housing Finance, HDFC; and Dr. Dalip, ASPD, RUSA, Chandigarh provided valuable insights to empower youth today by bracing them with revamped curriculum, enhanced social and technical skills. Ten students were awarded Pranshu Anmol Scholarship on the event. Prof. Kamlesh Bajaj, HOD Commerce presented a vote of thanks.